Intel has advanced its chip manufacturing technology with three-dimensional transistors that could make PCs, smartphones and tablets faster and more power-efficient. The company said Wednesday that it will implement three-dimensional transistors when making chips using its latest 22-nanometer manufacturing technology. The new chip technology, called tri-gate transistors, replaces flat, two-dimensional streams of transistors with a 3D structure, said Mark Bohr, an Intel senior fellow. A flat, two-dimensional planar gate is replaced with a thin, three-dimensional fin that rises up vertically from the silicon substrate. The technology will allow Intel to create transistors that are faster, smaller and more power-efficient, Bohr said. The benefits of the new technology will range across the product lines from the fastest server to the most power-efficient smartphone chips made by Intel. "We have to continually innovate new material and structures," Bohr said during a press conference held in San Francisco, which was webcast. "With 22-nanometer, this is the new structure." The tri-gate transistors will be up to 37 percent faster than Intel's current chips made using the existing 32-nm process. The 3D transistors also consume less than half the power of 2D transistors on 32-nm chips. The chips will also be cheaper, Bohr said. The benefits of the new transistor technology will be seen on the company's future Atom processors, said Dadi Perlmutter, executive vice president and general manager of Intel Architecture Group. Intel's low-power Atom processors are designed for tablets, netbooks, smartphones and set-top boxes. 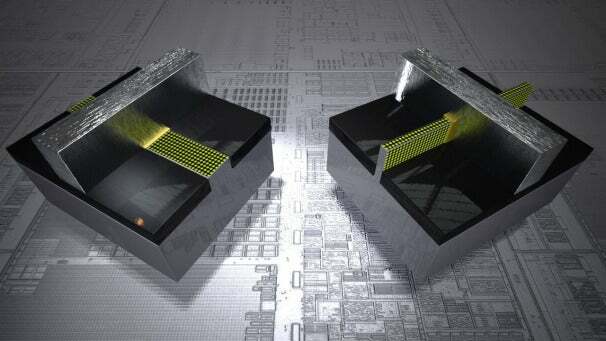 Chips with 3D transistors will be "powerful" on performance and "power-less" on energy consumption, Perlmutter said. The new design could help the company catch up with chip makers using ARM processor designs, Perlmutter said. ARM processors, which are used in most tablets and smartphones today, are considered more power-efficient than Intel's x86 processors. Intel researched the tri-gate transistor for 10 years, and Bohr claimed the company will be the first to put this technology into manufacturing. Other companies have explored 3D transistors, but have plans to send it to manufacturing with the 14-nm process technology, which is many years out, Bohr said. Building chips upward, much like skyscrapers, helps add more transistors while maintaining density and size of chips, Bohr said. The transistor structure allows Intel to continue the trend of Moore's Law, which calls for doubling the number of transistors every two years. "The difficulty in scaling a planar device was becoming extreme," Bohr said. The 3D transistor technology is an obscure detail, but the development is significant, said Dean McCarron, principal analyst at Mercury Research. "We tend to lose sight that this high-level stuff ... is tied to getting the transistor right," McCarron said. The 3D structure allows Intel to build more contact areas on smaller transistors, which enables more current to flow, McCarron said. That is key to scaling transistor performance. The odds of having a defect on a chip goes up as things are added vertically, McCarron said. "The fact that they are going into volume production means it has been perfected. The challenge for them is to make the choices to get there," McCarron said. Intel advances its manufacturing process every two years, which helps make chips smaller and drives raw system performance while using less power. The first chips to use the 22-nm process will be Core chips for desktops and PCs built on a microarchitecture code-named Ivy Bridge. The Ivy Bridge chips will have new features, including hardware support for the latest DirectX 11 graphics technology. Intel has also said it would release 22-nm processors for tablets in 2013. Intel in October last year announced it would invest between US$6 billion and $8 billion to manufacture new chips for PCs, smartphones, consumer electronics and embedded devices. Some of those funds will be spent on upgrading factories to make chips using the new 22-nm process. In addition, Intel in February this year also announced it would invest $5 billion to build a new chip manufacturing facility in Arizona, which is expected to be completed by 2013.